SMART SANTANDER project, which has been developed by several companies and institutions including Telefonica I+D and University of Cantabria, aims at designing, deploying and validating in Santander and its environment a platform composed of sensors, actuators, cameras and screens to offer useful information to citizens. 750 Waspmotes have been deployed to monitor different parameters such as noise, temperature, luminosity and CO. The city of Santander was divided in 22 different zones. Each zone had a Meshlium to gather the data from the sensors and the number of sensors depended on the area to cover. Each zone had different network parameters, creating independent networks that work on different frequency channels not to interfere with each other. Temperature nodes are able to measure ambient temperature within the range [-40,125] ºC. They provide the network with a high accuracy and a very low power consumption, fitting the requirements of the project. Luminosity nodes are capable of measuring the intensity of light received. It allows to detect light/darkness in the same way as a human eye would detect it. These sensors are connected directly to Waspmote without a sensor board. CO nodes detect changes in concentration of Carbon Monoxide from 30 to 1000 ppm. Pollution maps can be created using this sensor and its output. This sensor is connected to Waspmote through the Gas Sensor Board. Noise nodes may monitor noise pollution since they include a omni-directional microphone with an almost flat response in the whole frequency rang of human hearing, between 20Hz and 20KHz. This sensor is connected to Waspmote through the Smart Cities Sensor Board. Each sensor has two radios for communicating at 2.4GHz. On the one hand, DigiMesh is the protocol selected to send the environmental information. On the other hand, IEEE 802.15.4 protocol is used to experiment within the network. SmartSantander proposes a unique experimentation facility since all the nodes within the network can be used to test new algorithms while citizens still get information from their environment. If any of these 4 parameters goes above a threshold, then the system analyzes the information and may react sending an alarm to the central node (Meshlium in this case). In order to know where this sensor is located, each Waspmote can integrate a GPS, that delivers accurate position and time information. Waspmote is sleeping most of the time, in order to save battery. After some minutes (programmable by the user), Waspmote wakes up, reads from the sensors, implements the wireless communication and goes again to sleep mode. 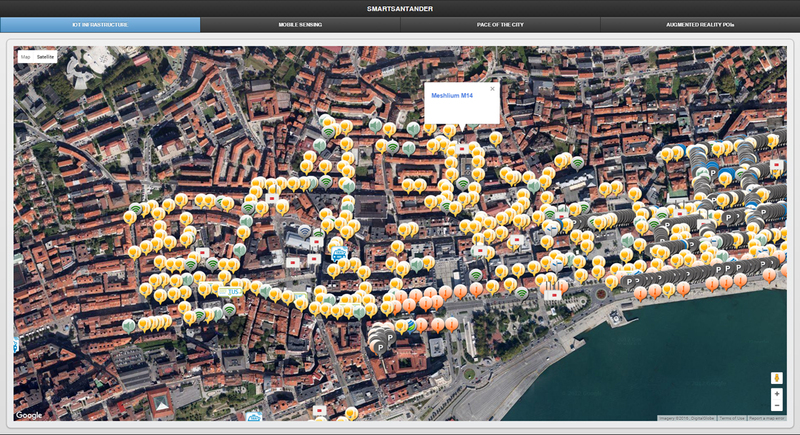 SmartSantander project has created an interactive map to view the different values that sensors are returning in real-time. In this way, citizens can consult environmental conditions around them. As a result of this project, environmental parameters can be monitored for further study as well as citizens can also know them thanks to real-time maps available for viewing. Furthermore, SmartSantander project is a large-scale network for experimentation that allows researchers from all over the world to test different algorithms in a real environment. If you want to know more details about parking infrastructure, please visit this article. General overview of the project can be found in this article. If you are interested in Waspmote, we will be glad to help you to design your system. You can request for a quotation of Waspmote here.